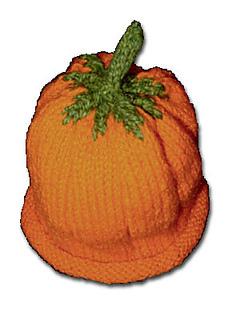 I know there are plenty of punkin-head hats out there, but I liked how the stem on this one worked out. There are 3 rounds, at the bottom of the stem, that use the 2 colors at once. So, technically, I guess you could say it’s somewhat “stranded” (although it certainly doesn’t appear that way.) There are 2 things especially nice about those few added, stranded rounds: First, they give it a more realistic look by allowing the green stem to reach down into the orange, as in nature. 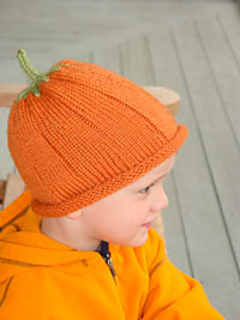 Second, they make the hat a great “first time” project for anyone who isn’t quite ready for full blown stranded knitting. It really doesn’t matter if you end up pulling the strands a little tighter than necessary, as many “first timers” do. The hat is gathered at that area anyway, so we don’t expect to see anything smooth there. Plus, a tight float would only give it a little more of a 3-D effect - perfectly fine, in this case.